For all our morbid bent and grave humor, plenty warms our hearts at the Death Reference Desk. Personally I (Meg) am a stickler for serendipity and random acts of stranger kindness, especially when it involves the internet and otherwise impossible interactions. This week the cardiac warm fuzzies involve… hey! us! all starting with a post I wrote in 2010. I used to live in Vancouver, British Columbia, and had been keeping tabs on Mountain View Cemetery—in this particular post, their quirky signage. Over a year later, in October 2011, Edward Millan of Wales commented on the post. 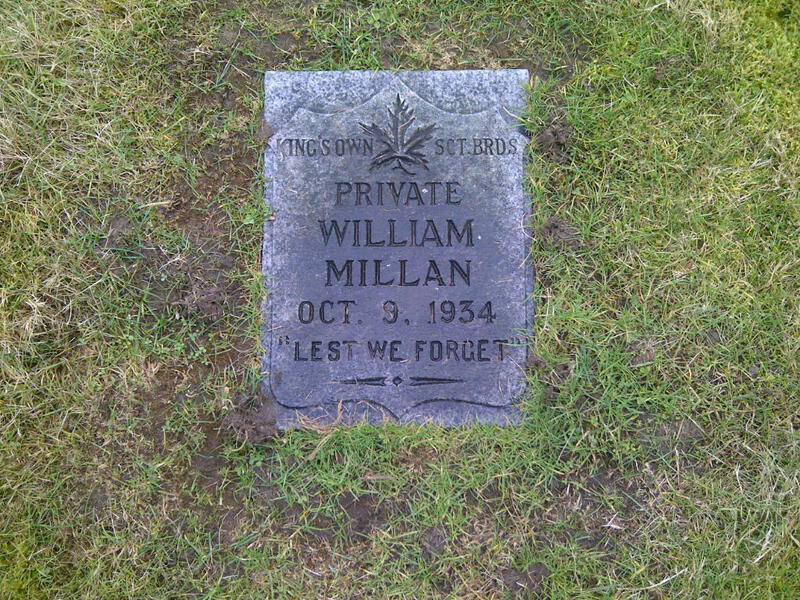 He was looking for information about the grave of his uncle, William Millan. Born in Scotland in 1901, as a teenager William served in the Kings Own Scottish Borderers during World War I. Later a farmhand, William sought a better life and immigrated to Canada in 1927. He settled in Vancouver but in 1934 died of tuberculosis. He was buried at Mountain View Cemetery. Unfortunately there wasn’t much I could offer Edward, the curious nephew half the world away. After hunting around the Mountain View website, I found the interment directory and cemetery maps, and made some screenshots that pinpoint the section and exact plot of William’s grave. This was something but left much to be desired. Then, out of nowhere in December, another random visitor to this random, old blog post offered to take pictures of the grave. Neville McClure of Vancouver figured it a “fun, little self-imposed errand” for a brisk afternoon and this week sent me photos that I forwarded to a very surprised, very grateful Edward. As a librarian and all-around internet fiend, I’m also fascinated by the role of technology in this effort. Instantaneous information and real-time communication get all the glory. Bombarded by the hype of social media networking and on-the-spot everything, we forget that the internet has a long memory and still works splendidly for asynchronous discovery and collaboration. 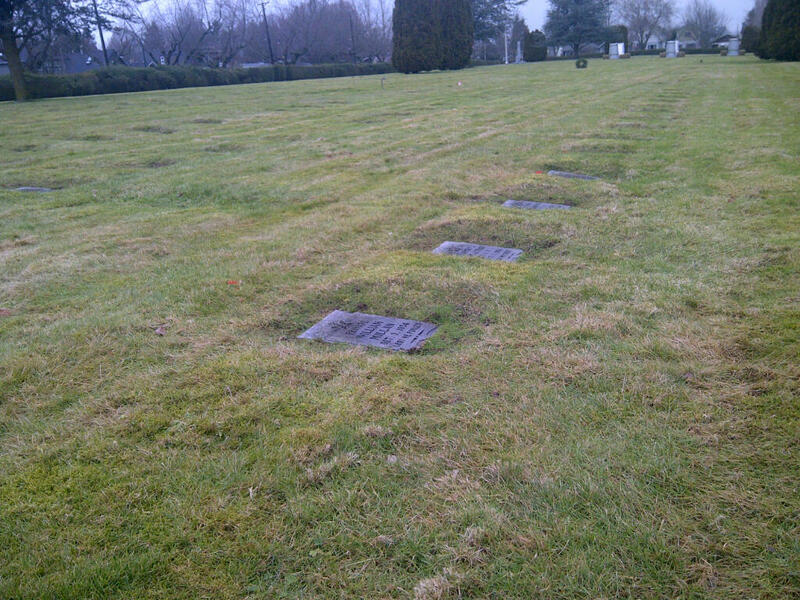 Posted by Meg Holle in Cemeteries, Death + the Web and tagged grave markers. Bookmark the permalink. What a wonderful story! Thank you for posting. 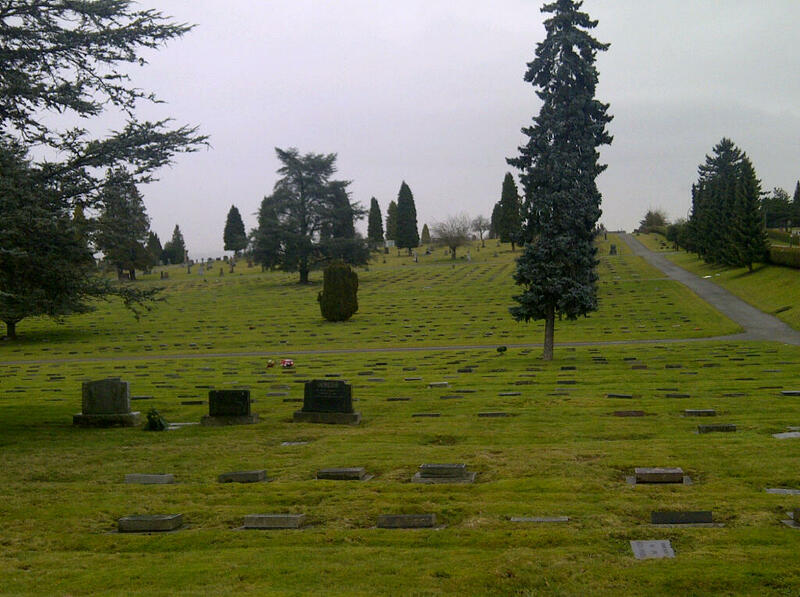 We at Mountain View Cemetery are also happy to help out with photos. If anyone would like to contact us at mountain.view@vancouver.ca with a request for a photo, we are happy to oblige. Oh, terrific! I planned to pass along this post to you, but you obviously already found it. Excellent, and thanks for the offer! Dear Meg. Have just picked up your message and write-up. Thank you so much to everyone. A gap in my family history has been filled, most grateful. The internet certainly speeds things up with what would normally take months to do by post.